If you want to travel to outside your own country you are probably going to want to keep in touch with someone. Maybe you want the convenience of calling for confirmation of bookings, or maybe you want to call home. If you are on a trip with other people who want to do separate things during the day you might want to meet up later for dinner. Texting where you are and when you will arrive keeps everyone happy. We have all gotten very accustomed to doing this with our personal mobile phones and smart phones. So how do you do this when traveling without coming home to a bill that is a jillion dollars? You have some choices. First off, if you just take your cell phone out of your home country, assuming you have a normal plan for minutes texts and data your phone will be roaming. If its roaming your carrier will charge you a lot more for every minute, text and megabyte of data. It could be hundreds or even thousands more than your usual bill depending on how much you use it. Call your carrier before your trip and let them know where you plan to travel. They probably have a special plan that they can put you on for one or more months that will give you minutes and data in foreign countries. The other thing to know is that some US phones are not compatible with every phone system around the world. If your phone is not compatible, they might even be able to send you a loaner phone to use that will work where you are going. Get your phone unlocked or acquire and unlocked phone and buy prepaid SIM cards when you get there. If you have a compatible phone (GSM for Europe, and most of the world) and it is branded with a US carrier you need to have it “unlocked” to be able to use it with any other carrier other than the one who sold it to you under contract. Depending on the terms of your contract, carriers will do this for you if you call them and explain your situation. You could also buy a new unlocked phone which is very expensive, but gives you the freedom to use any carrier you wish. There are also used unlocked phones for sale cheap through various websites. When you get to your destination, stop in an electronics store, probably right in the airport and buy a prepaid SIM card. The language to ask for this is usually universal in English, “prepaid SIM”. You can top up the card with minutes and know exactly how much you are paying. This can avoid surprise bills when you get back and it gives you a number local to the country you are in. I’ve found that this works well for talk and text, but I have run out of data quickly. Buy a phone there. 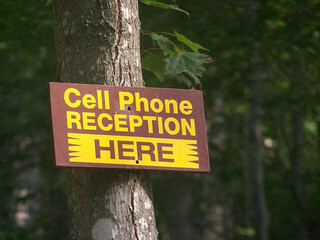 Mobile phones are ubiquitous around the world now. Countries other than the United States will usually have more options and choices than we have in the US. A cheap phone with a prepaid account might be good if you are going on an extended stay. Like the prepaid SIM in your own phone, you get a phone number local to the country where you are staying. It might not be the greatest new phone model out there, but it will allow you to keep in touch. When your trip is over you can sell it online or keep it for the next trip. You can always disconnect and go sans phone, or use wi-fi where you can find it. I have made several trips to England without a cell phone, or a GPS, and that included a multi-day hike across the countryside. If you are traveling with a group, maybe you will just have to plan a meeting spot and a time, and a backup in case schedules don’t work out. It’s the way we used to do it “back in the day”. Without that smartphone in your face you might just connect with a local in the pub instead of checking that Facebook feed. Most hotels, hostels and B&Bs have wi-fi so if you have a computer or tablet you can use Skype or something similar to make VOIP calls to your loved ones back home. If you do use your own phone in the case of alternatives #1 and #2, setting up your phone ahead of time will help to avoid racking up data charges. Be sure to go into the settings for your apps and turn off things like push notifications, automatic downloads, and be stingy when opening those posts and emails with attached photos. I have traveled before mobile phones, used a simple flip phone and I’ve gone to Europe with my own smartphone. I do like the convenience of using it for taking pictures, navigating with maps and sending texts, but the next time I’m on a short trip of two weeks or less, I think I’m going to opt for an international plan for a month. I used a prepaid SIM in my iPhone4S and found that I kept topping it up just keep using data, and I probably spent as much doing that as I would have for one month of an international plan with my carrier. How about you? Have you used your mobile phone while traveling internationally? Please share your experience in the comments.